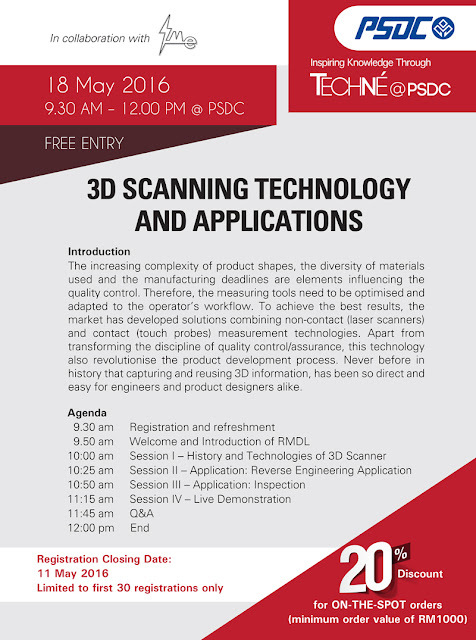 You’re Cordially Invited to Techné@PSDC! Starting this month, Penang Skills Development Centre (PSDC) is organising a series of technical talks and lectures at Techné@PSDC, aiming to inspire innovation through knowledge sharing by experts in the Engineering field. We have been working with PSDC through various initiatives for more than 10 years. In year 2014, we have brought our partnership to a new level by setting up Rapid Model Development Lab in their centre - a one-stop product design and development centre.